Scooter’s headquarters in Omaha, Neb. was not large enough to sustain the company’s necessary output long-term. A new headquarters was needed. Founded in 1998, Scooter’s Coffee is a national brand with nearly 200 locations in 16 states. Each of the company’s stores receive both coffee and pastries from the corporate headquarters. With more than 150 franchise commitments for new stores, and the goal of becoming the #1 drive-thru coffee chain in the country, demand has grown significantly in the past ten years. 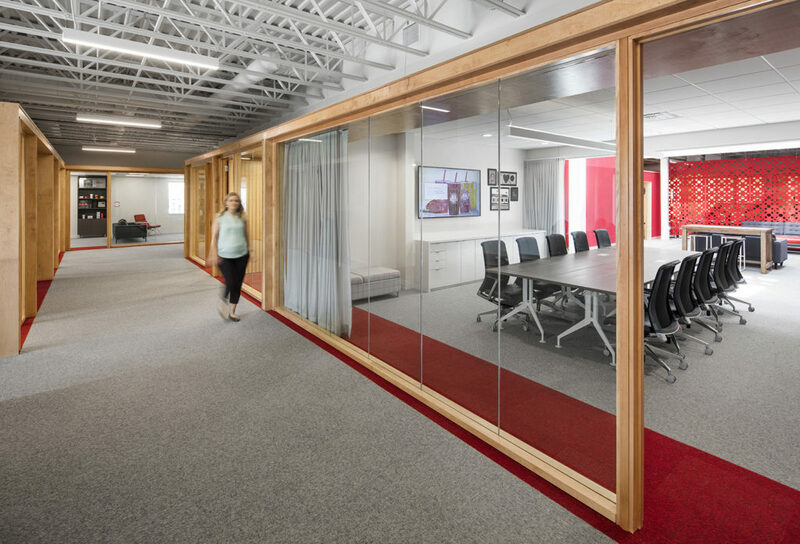 As Scooter’s engineering and building science consultant, BranchPattern partnered with BVH Architecture to create a space that responds to company growth, elevates the brand and attracts new talent. As the outward face of the company, this building is what franchise owners initially see when they join the Scooter’s team. Scooter’s wanted their headquarters to deliver a wow factor. “We work with really creative people who have dreams, and we understand the visual goal is to create something that inspires and creates wonder, and from an engineering standpoint, we support that,” said Maniktala. Creating inspiring spaces that work efficiently can be more cost-effective when the engineering team is engaged early. BranchPattern continually advocates for this type of workflow because it simplifies future decision-making by considering later needs in addition to what’s obvious today. Early engagement allowed BranchPattern to proactively test for issues in Scooter’s new headquarters that may have otherwise been noticed after a year or more of operations in the form of higher energy bills, equipment failings and occupant complaints. The team was able to help avoid costly errors by measuring whether building systems were functioning and communicating appropriately. Within 15 minutes of the call I was onsite, identifying the issue and what steps needed to be taken. Efficiently using resources was essential to the Scooter’s team, and after looking at the cost of constructing a new building, it was decided that a renovation would be the most economical option. After considering several possibilities, a former paper warehouse was chosen near interstate 80. However, unique obstacles came about during the design and construction phases. Due to the office area being located beneath an existing mezzanine, there were physical constraints for the ductwork caused by open-web steel joists. Precise measurements were required in order to optimally fit the ductwork in this area and preserve the building structure. As a cost-saving measure, instead of replacing the electrical system within the building, the BranchPattern team updated the building’s existing electrical system to the applicable codes. BranchPattern worked to ensure that all electrical elements throughout the building were updated appropriately, such as power distribution, fire alarms and lighting controls, even going so far as to make a house-call of sorts. In addition to renovating the new headquarters, Scooter’s had a looming deadline for vacating their former offices. 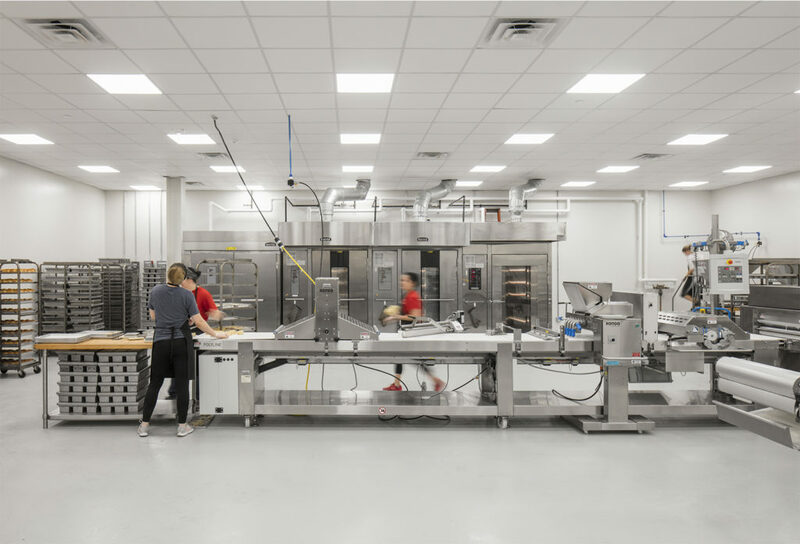 As the new location where the coffee would be roasted, packaged and shipped, it was essential to move equipment over without disrupting the production schedule. A feat that was accomplished with great planning and a willing team. The architect incorporated numerous backlit translucent panels on the front of the building and within the entry-way. From the highway, BVH Architecture’s design backlit by BranchPattern’s custom lighting makes a dramatic statement. “The architect did a great job of reskinning the front of the building and turning it into this glowing wall of light. You drive by it at night and it delivers that ‘wow factor,” Koelzer said. Today, Scooter’s employees are at work inside the new facility. BranchPattern’s next step includes conduct post-occupancy evaluations with increased productivity and satisfaction set as key performance indicators. Tests include employee surveys gauging the satisfaction and engagement of employees within the building. Findings will be shared and discussed with the Scooter’s stakeholders, as well as the company’s HR Director, albeit not a typical approach.